Lady Faith MacAlister wishes for adventure, be careful what you wish for . . .
Huntress Lady Faith MacAlister seeks adventure. Her fatherâs dying pledge tethers her to Wild Thistle Keep, thwarting her desire to explore the world beyond the palisade. Solace is found while hunting and providing sustenance for her clan. When snatched from the safety of MacAlister lands by a rogue bent on securing a ransom, she finds the adventure of her life. Disgraced Captain Graeme Ross travels the high seas in search of bounty to sell in order to secure family lands seized by the Crown. He longs to regain his honor in his fatherâs eyes and continually risks his life buying and selling goods. Lacking enough funds, Graeme and his crew follow Lady Faith MacAlister as she hunts. Out of need and desire, he kidnaps her. The lady captivates him for the moment he laid eyes upon her. Bold and spirited, she fights him. When he negotiates a ransom, deception tears the burgeoning romance apart. 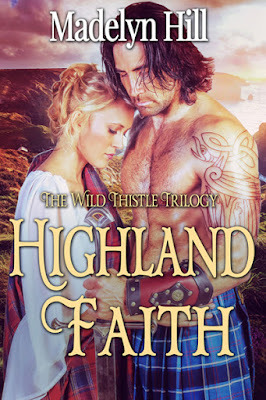 Now, Faith and Graeme seek to settle those differences hindering their union, despite the stretch of sea and landâand angry Highlanders standing between them. Madelyn Hill has always loved the written word. From the time she could read and all through her school years, she'd sneak books into her textbooks during school. And she devoured books daily. At the age of 10 she proclaimed she wanted to be a writer. After being a "closet" writer for several years, she sent her manuscripts to the universe and is now published with Soul Mate Publishing. And she couldn't be happier! A resident of Western New York, she moved from one Rochester to another Rochester to be with the love of her life. They now have 3 children and keep busy cooking, going to the movies, and of course reading!